Stephen James, music director at the Eliot Church, has performed for the Tanglewood Music Center Chamber Series, the WICN Radio concert series at Mechanics Hall (Worcester, MA), the Omnibus Series at Boston University, and on many other concert series in New England. He is a composer as well as a pianist and organist, and completed his doctoral degree in composition at Boston University, where he received the graduate composition prize in 1984, the Malloy Miller Composition Award in 1986, and an award for continuing musical excellence in 1987. His music has been performed by nationally known ensembles and soloists, including baritone Sanford Sylvan, the Pro Arte Chamber Orchestra, the Washington Music Ensemble, and the Atlantic Brass Quintet. 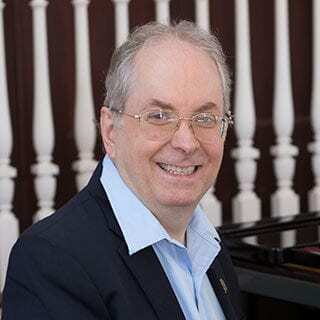 He has taught composition, piano performance, music theory and related courses at Amherst College, Boston University, the University of Massachusetts at Dartmouth, and Bridgewater and Worcester State Colleges. For information about Stephen’s compositions and performances as a pianist, or to inquire about lessons, please visit to his website.